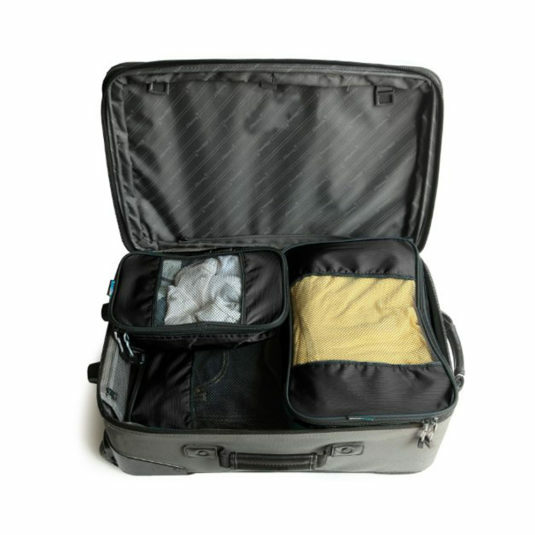 TravelWise 3 Piece Packing Cubes in silver &teal comes in the following sizes and dimensions small size 11.5″ x 6.75″ x 3.75″, medium size 13.75″ x 9.75″ x 3.75″, and large size 17.5″ x 12.75″ x 4″. Constructed of high-quality, durable nylon fabric with 2-way easy-pull zippers with an open mesh design provides breathability and visibility, making it easy to locate items. Clothes stay neat and tidy in their own small drawers and do not shift in transit and efficiently utilize all interior luggage space. These fit perfectly inside your travel bag to hold socks, underwear, hygiene products, shirts and more. They can also be used for college kids going back to school to have more room in their dorm for other things. My Opinion: I found the cubes to be breathable and I like the see-through top as I can what is inside so I do not forget anything. I am using mine for socks, underwear and more when I travel and move Labor Day weekend.